One of my favorite stamps happens to be a Wags and Whiskers stamp called Angel Whispers. Not just because the little Angel represented in this stamp was in my very first Kindergarten class. Not just because my friend Lacey happens to co-own Wags and Whiskers. Not just because Lacey is the little angel's mother. Not just because Lacey was the wicked person to introduce me to this addiction called stamping. I am laughing laughing laughing!!!!!!! Hugs to Lacey, Ansley and Ryan (who also happens to be represented in my favorite Superhero stamp)! I just really like the stamp because it just looks really sweet. I really like how the little angel is just there peacefully with her sweet dog (who also happens to look like a dog I had when I was younger) and beautiful butterflies. I made this card for my son's teacher's birthday. It was put together very quickly. I had already colored Angel Whispers a while ago but never did anything with her. She was embossed on watercolor paper and colored with Twinkling H2O's and backed on SU Bashful Blue. The card base is SU Regal Rose. 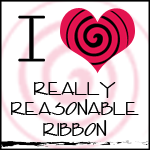 The DP, brad and ribbon are from my stash. Flowers are primas. I also added stickles to the wings of the angel and butterflies. I am also entering this card in the Flutter By Wednesday #105 Challenge which is open but you have to have a butterfly, angel or fairy. 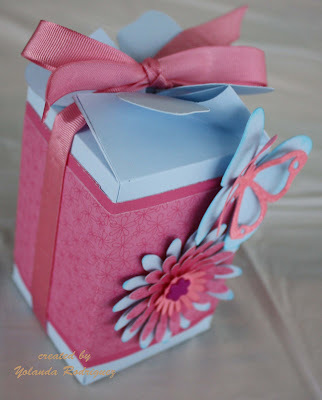 I also made the following box to go along with the card. It is from My Time Made Easy. It is called Shutterfly. It's an SVG file that you can cut with your Cricut. I made the box big enough to fit 6 Yankee Candle votives. 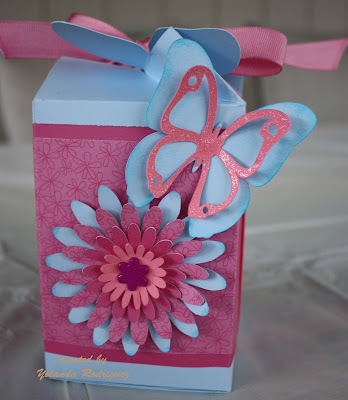 The flower and butterfly on the front were made with with the Cut file Flutters and Flowers. The cricut is awesome! The next picture is the top of the box. Hello~ I am new to your blog which I found on one of my followers' blog. Your blog is so nice but your projects are just beautiful. I love to peek in & see others creations & sharing crafting news we can all use. Hope you can stop over at my blog too. I am hosting a giveaway in honor of hoping to reach 100 followers. I will be stopping by your blog for inspiration often. I can almost smell those candles from here (lol)!! Me loves Yankee Candle...of course we don't have it here in the Great White North but whenever I cross-border shop (yes I do, I admit it) I love going into that store to smell the product :) All kidding aside this project is lovely--I am sure your son's teacher will appreciate it!! 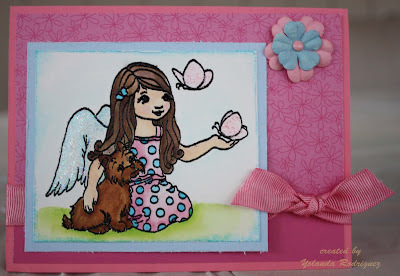 Your card is very sweet too--love the glittery wings!! It neat that you actually now the little one who the stamps is made after! So glad Lacey introduced you to the world of stamping!!! Such wonderful creations! Thanks for playing along with my flutter by challenge! Wow! These are all wonderful creations and I love the colors you used for all of them! Thanks for joining us at FBW!